Backplates with retroreflective borders have been shown to help drivers navigate intersections during power outages and low visibility conditions. 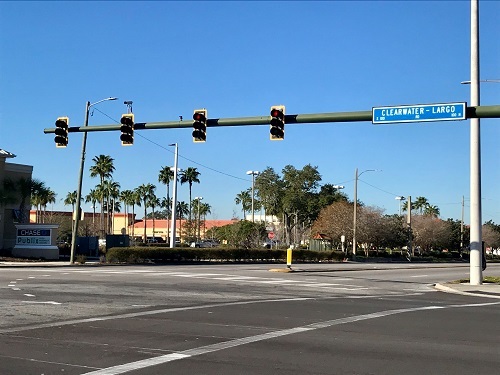 PINELLAS COUNTY – To make intersections safer, Pinellas County is installing backplates with retroreflective yellow borders on traffic signals throughout the county. Backplates improve the visibility of traffic lights by providing a controlled-contrast background. A retroreflective border makes the signals even more conspicuous in both daytime and nighttime conditions. The Federal Highway Administration approved their use after a seven-year study showed they reduce crashes at intersections by 15 percent to 24 percent. “The installation of retroreflective backplates at all of the county’s signalized intersections supports our continued effort to team with our partners at the Florida Department of Transportation to ensure a safe and effective transportation system for our citizens and visitors,” Pinellas Transportation Division Director Ken Jacobs said. Backplates with retroreflective borders have been shown to help drivers navigate intersections during power outages and low visibility conditions. They are particularly helpful to older and color vision-impaired drivers, enabling them to better recognize which signal light is illuminated. Residents will see the new backplates at intersections along West Bay/East Bay Drive from Indian Rocks Road to 46th Street near St. Pete-Clearwater International Airport. Once the project is complete, more than 200 signalized intersections in Pinellas County will have the backplates with retroreflective borders. Photos courtesy of Pinellas County.